BOULDER, CO – Natural Habitat Adventures has introduced a new opportunity to get behind the scenes and assist with panda care on its China nature adventures. Guests can enjoy a one-day volunteer experience at a Chinese research base that has helped pull giant pandas back from the brink. The optional caregiver opportunity takes place at Dujiangyan Panda Valley, China’s newest facility for panda research, education and conservation located outside Chengdu. It is included on both Nat Hab’s Wild Side of China Nature Odyssey and Wild Side of China Photo Adventure. On both panda-focused itineraries, travelers have the rare chance to spend a day with panda keepers, enjoying pandas at close range while assisting with tasks that are part of the daily care routine, such as feeding pandas and cleaning enclosures. This intimate contact comes in the context of a celebratory victory for conservation, as China’s giant panda population was recently downgraded from endangered to vulnerable. 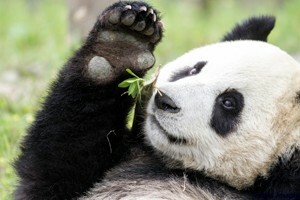 While giant pandas are still at risk, their numbers continue to rebound. More than 1,800 were counted in the wild in China’s 2014 survey, a jump of 17 percent since the 2003 national census. Top naturalist Expedition Leaders provide insight into this success story on Nat Hab’s two 12-day itineraries, which offer the most panda-intensive and nature-centered exploration of China provided by any travel company. In addition to visiting three different panda research bases, guests are immersed in the giant panda’s wild native habitat, including two days in a remote mountain nature reserve in Sichuan Province that few tourists ever see. On this rare expedition into the Minshan Mountains, walks and wildlife drives in this virtually unvisited preserve provides reveal the panda’s native environment, including lush bamboo forests, river gorges and waterfalls. Because wild pandas are highly elusive, guests are not likely to see them, but approximately 60 live within this densely forested 100,000-acre sanctuary. The reserve is rated as a Grade I global biodiversity hotspot by World Wildlife Fund and is home 430 different mammal species including golden monkeys, Tibetan and rhesus macaques, musk deer, muntjac, serow, wild boar, blue sheep, and endangered moon bears and red pandas. More than 2,400 different plant species and 150 bird species are also found in the park, including the golden pheasant. Both itineraries also include Jiuzhaigou National Park, a UNESCO World Heritage Site and UN Biosphere Reserve, containing some of China’s most dramatic wild landscapes. Guided walks showcase steep peaks, ravines, forest, meadows, marshes and a multitude of lakes and waterfalls. The park’s most distinctive feature is its terraced limestone pools filled with turquoise water that flows in crystalline cascades from ledge to ledge. Each departure is led by a Nat Hab Expedition Leader who has trained with WWF scientists and researchers, along with a top Chinese naturalist guide. Travelers benefit from a breadth of expert scientific knowledge, authentic cultural insight and attentive personal service. Photo tour departures feature personalized guidance from an expert professional photographer. This unique itinerary also offers an unusual chance for Western visitors to witness rural Chinese life. In the Gansu Muslim village of Qing Xi, guests stroll among 300-year-old wooden buildings from the Qing dynasty. On an overland journey onto the Tibetan Plateau, they traverse a landscape dotted with fluttering prayer flags and chortens and share lunch with a Tibetan family. And on a visit to a small farm, they learn about a WWF-supported bio-waste project that uses agricultural by-products to create cleaner cooking fuels, reducing local wood consumption and preserving habitat for pandas and other wildlife. The per-person rate, based on double occupancy, starts at $10,495, for both regular and photo departures. 2017 season departures are: April 2, April 6 (Photo Tour), April 16, April 20 (Photo Tour), May 1, May 4 (Photo Tour), Sept. 3, Sept. 17, and Oct. 7 (Photo Tour). Dates also available for 2018. For information on all of Nat Hab’s trips, descriptive itineraries, date availability and reservations, call 800.543.8917 or visit http://www.nathab.com/. Click HERE to order a copy of the 2017 catalog. Natural Habitat Adventures is a world leader in responsible adventure travel and nature-based ecotourism. Since its founding in 1985, the company has offered eco-conscious expeditions and wildlife-focused small-group tours to the planet’s most remarkable nature destinations. Inspired and created from years of scouring the planet for the singular and extraordinary, Nat Hab’s itineraries are artfully crafted experiences that are far from “typical.” Trips are guided by professional naturalist Expedition Leaders, and Nat Hab enjoys a longstanding reputation for hiring some of the world’s best guides. Conservation is at the forefront of everything NHA does, and its philosophy is simple: tourism must work with and benefit local communities, which will in turn find value in protecting natural resources and wildlife. NHA is proud to be the travel partner of World Wildlife Fund, sharing a mutual commitment to travel as a means of helping to protect the world’s wondrous natural places. Nat Hab has donated more than $2 million to WWF and will continue to donate 1 percent of gross sales plus $100,000 annual through 2018 in support of WWF’s mission.